It is a big decision. It is a lot of money. It is a big piece of equipment that will take up space. There really is a lot to consider. Do you want to go to the expense of 220 line or get by with what you already have? We sell Olympic Kilns at Stained Glass Express. www.greatkilns.com. We love their support and we love the kilns. Basically, you have a box made of firebrick that is attached to a controller. So the support piece is BIG. For your workspace you should be prepared to make it a fire proof space. Easily done. Flame resistant sheetrock or metal set away from the wall. Put it on something that won’t burn. Common sense kind of stuff. Don’t burn your house down. The big difference between having a 110 line and a 220 is the depth of the kiln. When there are two elements in the kiln you can run it on a 110 line. 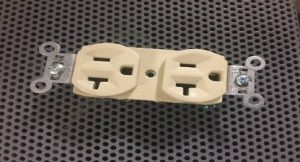 You just have to change the outlet to accommodate the commercial plug. Consider what you want to make. Jewelry and little dishes. You are good with a little kiln. If you think BIG, you will need a bigger kiln. Maybe one with a clamshell feature so that it opens from the top and the bottom. You can get one that bottom slides out. Features to consider when thinking about putting things in the kiln and getting them back out. If you want to do tall things like a drape lamp shade or vase you should consider bringing in that 220 line. The 220 allows the kiln to have three elements and therefore it can be deeper. Everyone I know, recommends upgrading to a digital controller. One where you can save multiple programs. We sell the RTC-1000 with great results. We can store 6 programs which pretty much covers everything. What you definitely do not want is one that you have to babysit and make sure it gets turned off. You run around with a timer around your neck (seriously) and I have heard terrible results of kilns burning through when someone went to bed and forgot. One more thing to put into your brain. 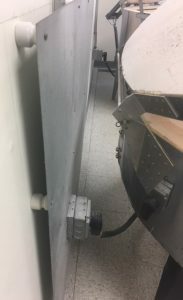 If you think you ever might get into glass blowing or bead making you might consider a kiln with a punty door that you can use to anneal your beads. This entry was posted in Historic Artists, Modern Artists on May 11, 2018 by admin.